We arrived at Fiche and met with Dr. Tesfay from the Ethiopia Institute of Biodiversity Conservation, over a late lunch. The Institute, a government body responsible for the preservation of Ethiopia’s ecosystems and genetic resources, is working with Lizzie on the research side of the project, along with Addis Ababa University. He told us about some of the work the Institute has been doing in Fiche and surrounds. He told us how a local Aloe species, which we’re keen to grow in the garden for its antiseptic properties, is harvested by the farmers of the area and used to soften and seal coffee sacks for export. Some years back, it was discovered that the hydrocarbon chemical they were previously using was leaching into the coffee and making it carcinogenic on consumption. Germany put a ban on all coffee imports until an Indian textile merchant working in the south of Ethiopia, began using the aloe instead. It was mixed with water, completely non-toxic. The aloe grows wildly around Fiche and as this new production method became popular, the Institute of Biodiversity began monitoring the harvesting of the plants to ensure their use would be sustainable; limiting pickings to five stems of each mature plant. They found there were no negative environmental impacts, and the farmers, who had previously slashed the aloe and thrown it away as weeds, are now cultivating them carefully as an important source of new income. The Institute is also in the process of setting up a new seed bank in Fiche, after a fire threatened their only bank in Addis recently. Two weeks back, they also discovered a plague of weavels and have had to fumigate the rooms with insecticides, making the need for a second ‘safe-guard’ bank even more pressing. Unfortunately, bureaucracy is slow and as Lakew says, “We and Dr Tesfay are in the same pot of stew here.” The Fiche Kebele (local administration) are taking their time organising consultations with the 250+ farmers in the area to approve the seed bank. In fact, the institute has been trying to secure land for the last 10 years. They’ve also been slow approving our herb garden as a non-government operation eligible for tax exemptions on building materials, soil, resource and operation costs. “We should hear from them today!” says Lakew optimistically. We went to visit the plot of land on the edge of the town so that Dr Tesfay could take presses of the herbs already growing there and identify them properly. The land is opposite the Santa Mariam church and a sacred site of holy water – a well in the field below the road. Lakew gave us a tour; trotting between low growing plants, nettles and twigs poking out of the ground to show us what they really were. Lakew is a small man with a head full of thick white hair. He’s 73 years young, and says he is shrinking “That is the worst thing about getting old you know?” he says “But I am compact!” Then he paced out the different portions of the land in giant steps to show us what he had in store for them. “This here will be four metres for the driveway – 1, 2, 3, 4” – and he was on the other side of the bore hole. “And this is where we’ll have the coffee shop – it’s perfect just here you know?” and he was already at the far fence with the rest of us stumbling over rocks to catch up. 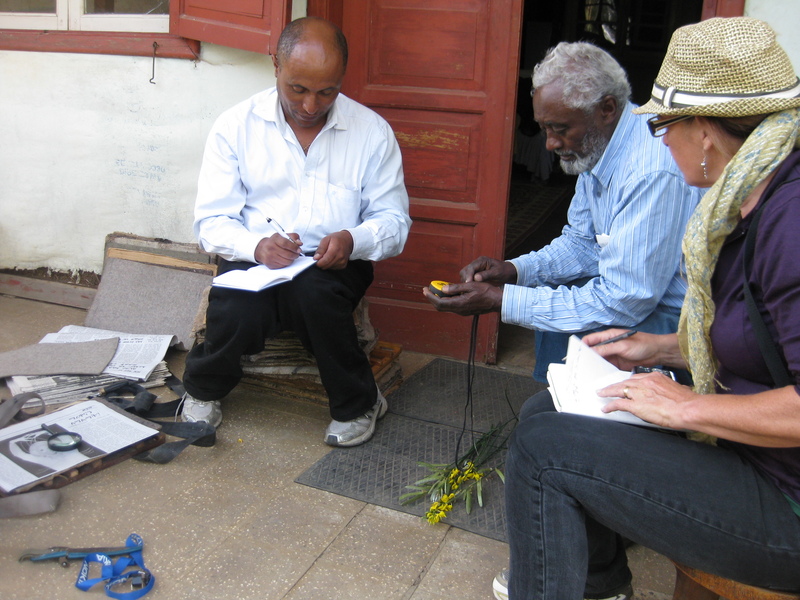 We walked the garden, photographing the herbs and identifying them with Dr Tesfay and the help of two herbalists who had been working on the garden. We would later go through the same at Lakew’s home; Dr Tesfay pressing the herbs between newspaper and board as we looped around the garden, past the bee hives at the back of the house. 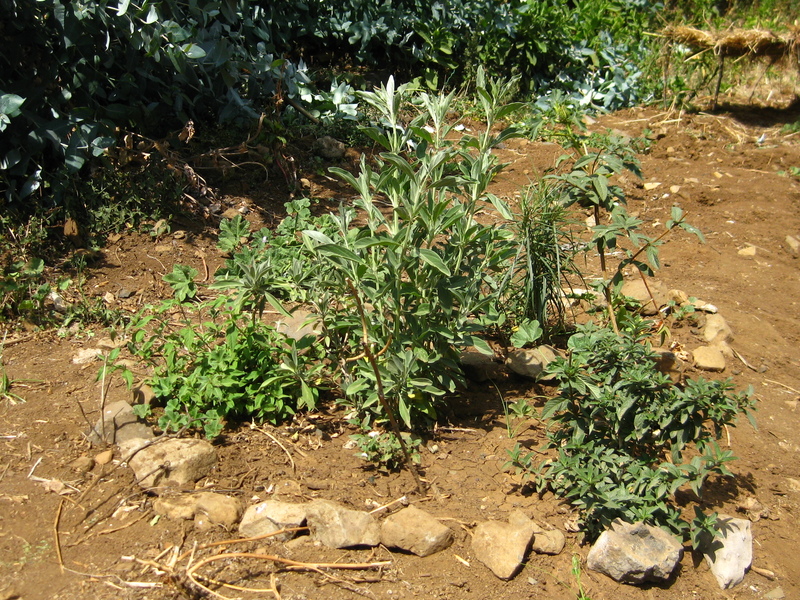 We had also brought some young seedlings from a visit to a herb farm in Chencha on our trip down South; Stevia (with leaves so sweet it is used as a sugar alternative by diabetics), Lominat (lemon verbena) and Ariti (Artemisia annua). With the sun going down, we filed into one of the concrete rooms in the compound. In one corner of the room, Lakew’s cousin’s wife, Shikerke, sat and rocked an earthern pot of milk into butter; in the other, the herbalist men from the community joined us to talk remedies. Here, herbal medicine practice seems to blend plant remedies with the seasons and the spirit world; religion, superstition and tales passed on in the oral tradition. The conversation moved between detailed herbal preparations and town legends. The people shared remedies for whooping cough and asthma, tapeworm, scorpion stings, burns, contraception and fertility. In some instances, one should boil the roots of plants to drink, others only the young shoots. Some should be drunk with the local alcoholic brew –Tella, in other instances, mixed with coffee or Arake, a potent spirit. 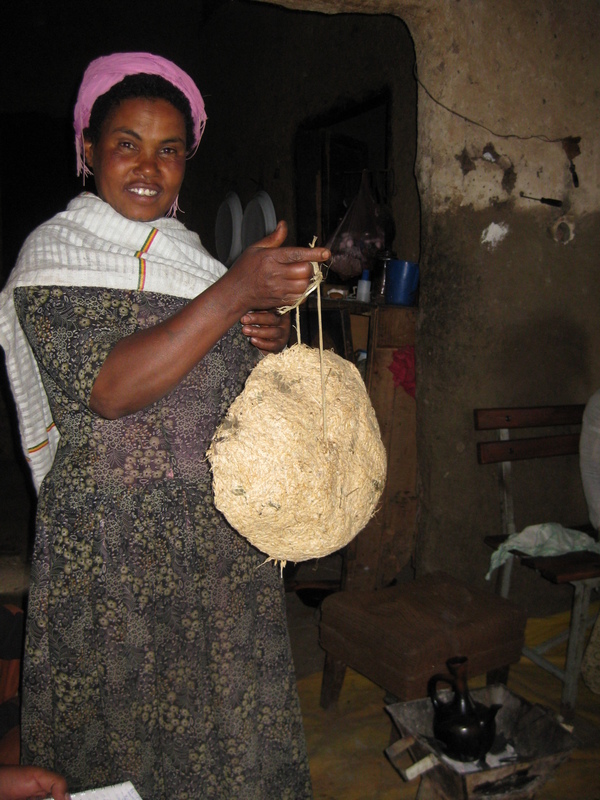 We’re told that in Ethiopia, all herbs for the year should be collected on the 17th October. 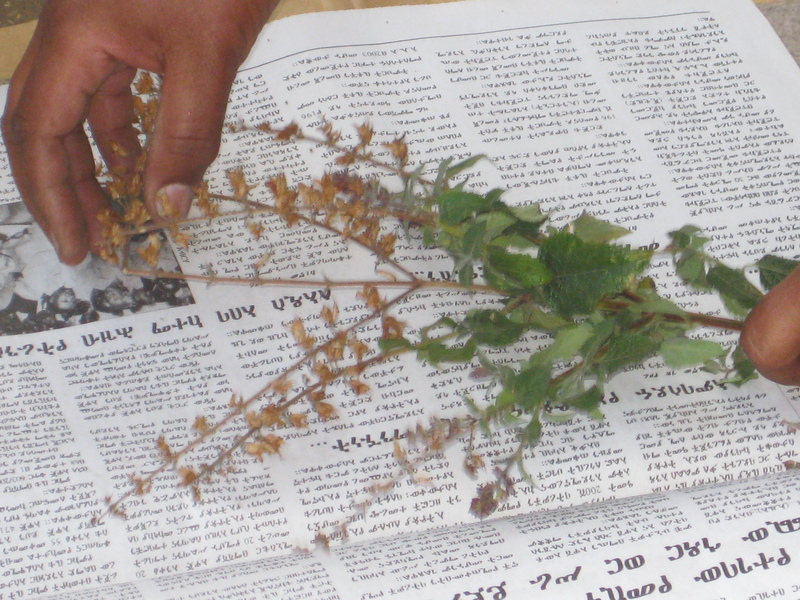 The date is auspicious and it’s the very middle of Ethiopian spring when the herbs are abundant. It’s also practical; as one man explained – a person should not be scrambling around the field in search of remedies when they’re ill, but should have a store within reach all year. As it got dark outside, a chicken skidded into the room and flapped onto the television set, looking for a place to lay its eggs. Shikerke could only catch it by turning the lights off, so, with a squawk and much laughter in the pitch black, she flung it out the door and into the night again. And it was time for us to leave as well; we had to get back past the infamous Zerefer bridge, a dark gully on the road to town known for looting and strange disappearances – so we’re told.